If happiness had to be explained in a picture – well there you go. This is one of mom’s all time favorite desserts. I know – I know. Has there ever been a dessert that mom has turned her back to? Of course not. But this one she said is exceptional. Right now the current thing for deserts are those molten lava cakes. This is one of those with a twist. The inside of this cake is filled with caramel. Then the topping is ice cream. All of the dusting around the plate and on top – that would be salted caramel. Go ahead. I’ll give you a moment to ooh and aaw. Mom says it’s very sweet but when you need something straight up with some extra special kick, go for this treat… the salted caramel lava cake. Friends, this is a great one today. I know – I know. I say that every week on my Travels in the South. But listen – every week I think there is absolutely no way that mom/dad can top the week’s prior Travels in the South. And every week, this little oinker is wrong. Right after mom’s accident (4 weeks ago today), she was feeling really icky and low. So dad treated her to this masterpiece. What is it you ask? Daddy was speaking with the owner of a local restaurant that we go to a lot and was telling him that mom needed something to pick her up. The manager sent over this creation on the house. This is called Goo Goo Crunch pie. 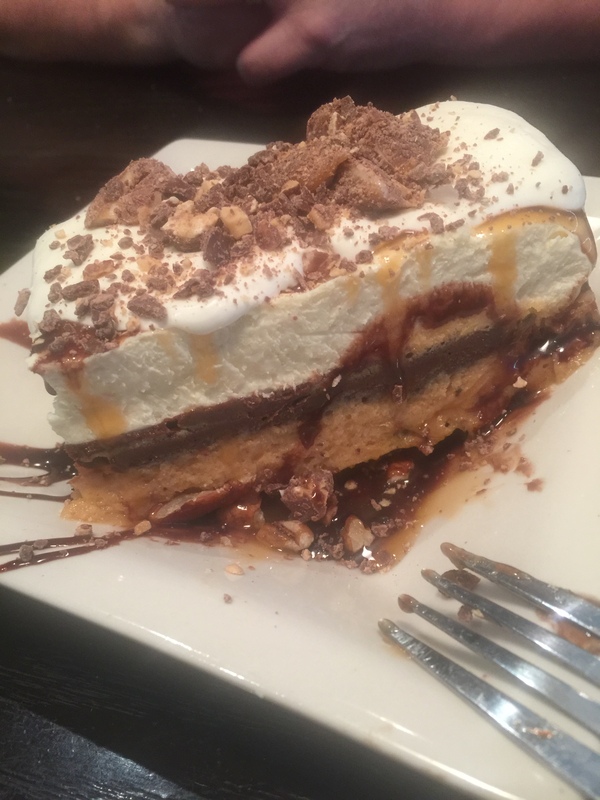 It has layers of chocolate fudge, peanut butter mousse and a nougat cream topped with caramel, chocolate sauce, fresh whipped cream and oh yeah – chopped up Goo Goo Clusters. Can you say insanely wicked good?! Daddy said that he could tell it was good. Not by the smile on mom’s face. Nope. Daddy said he could tell by the groans coming from mom. Oh my piggy heavens. Watch out Billy Crystal and Meg Ryan. Daddy said mom had you beat on this day – snorts with piggy laughter! ◊ Store bought cookies (no lying). Get a package of the soft cookies – you don’t want a hard one. Or you can make your own. Now remember to buy twice as many cookies because you will need two cookies for every Whoopie Pie. I bought a package of 24 cookies from our local market for $3.29 – I bought Macadamia cookies. Buy and make whatever kind of cookies you like. 24 cookies will make 12 Whoopie Pies. ◊ Here is the tricky part – what do you want for your center? You have several options. You can buy a container of Cool Whip. You can buy those little containers of pre-made frosting. Or, you can be lazy like me. I asked the bakery department at my market to whip me up some butter cream frosting. A huge container cost me $4.99 – and that is more than enough. Welcome my friends to another edition of Travels in the South. This weeks find is something sinful. 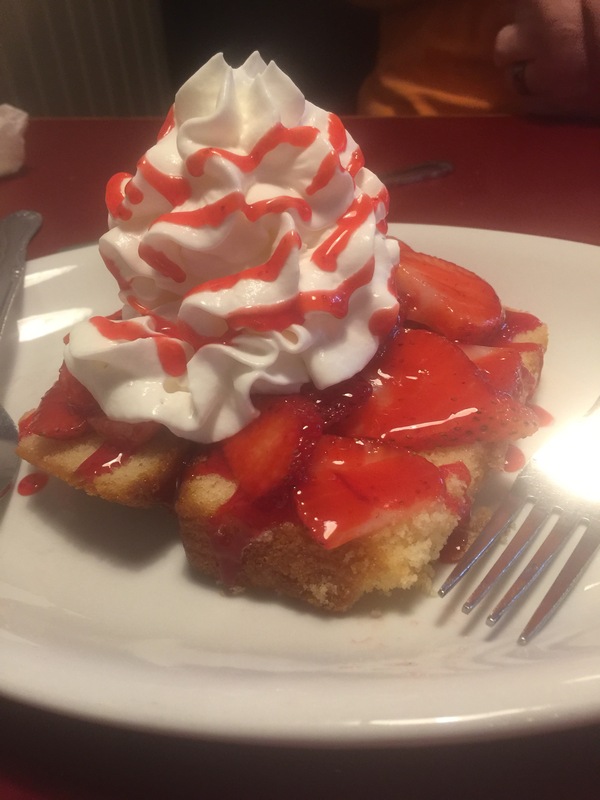 It is something so delicious that you and your spouse will fight over the last bite. 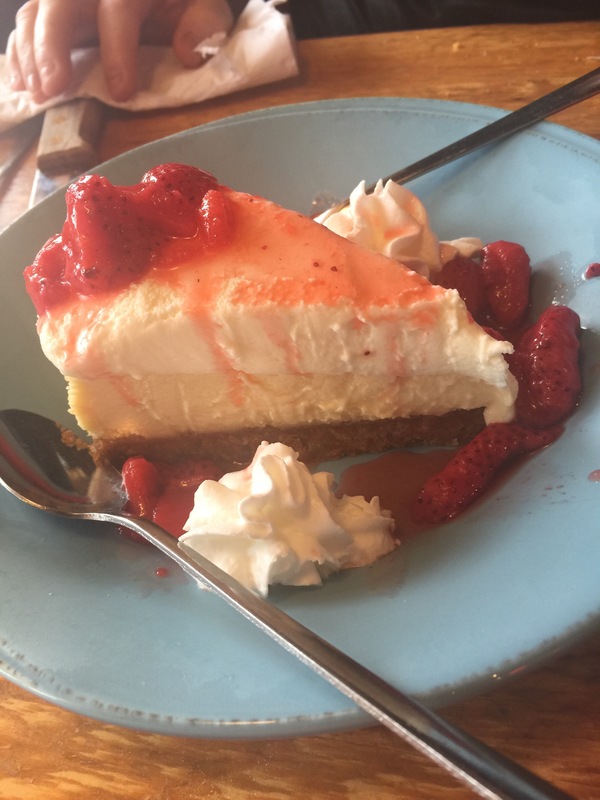 Heck, you might even want to get your own slice of this heaven so you don’t have to share. This week’s find is called Sogno Di Cioccolata – translation “Chocolate Dream” Now look at that picture. Isn’t that the best way to describe it? Chocolate Dream. Are you asking yourself what is in this masterpiece? 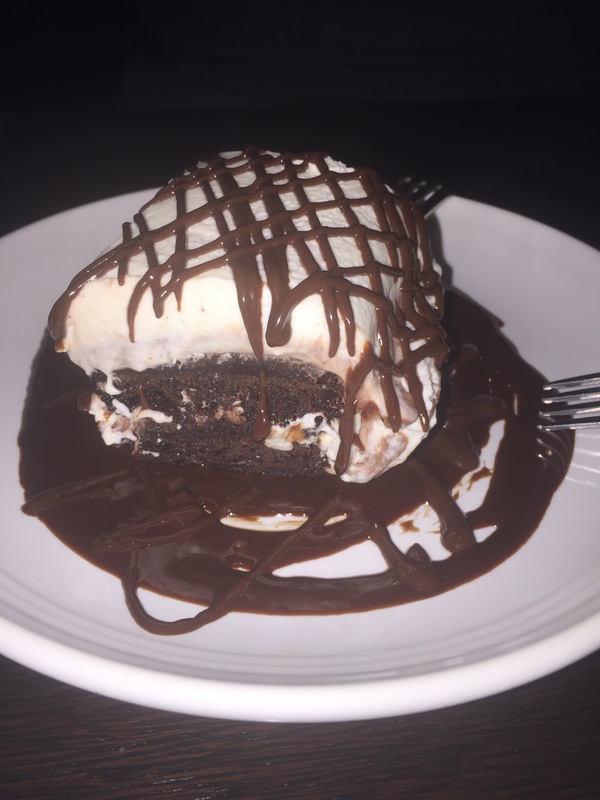 It’s a rich fudge brownie covered with a chocolate mousse and topped with fresh whipped cream and drizzled with chocolate sauce. Oh, did I mention that it’s also sitting in a puddle of rich chocolate? Mom/dad always share one of these delicious creations because it is so rich and heavenly. But they do fight over the last bite… or should I say they play paper – rock – scissors. Snorts with piggy laughter.